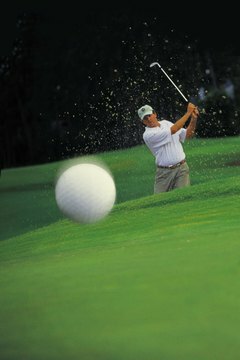 Consider your golf ball's construction before you hit the course. As much as technology has improved the golf ball’s cover – using new dimple patterns to help the ball fly farther and straighter – engineers have also improved the ball’s interior. Beneath the cover, the ever-changing golf ball features a variety of materials and structures designed for players of different levels. Cheap, one-piece driving range balls are made of the same material – generally surlyn – inside and out. Other than that, all balls have a separate core beneath the cover, while some feature multiple internal layers. Liquid cores were once common in three-piece balls, but are less so today. Contrary to golf folklore, the liquid cores aren’t dangerous. Titleist, for example, has used a salt water and corn syrup blend. Today’s core is generally made from synthetic rubber -- which may be mixed with bits of metal, such as tungsten or titanium -- or a plastic-like material such as acrylate. Some Callaway and Titleist balls, for example, use polybutadiene – a synthetic rubber – in the core. A recent Nike four-piece ball features a resin-like material the company refers to as RZN in the core. Three-piece balls used to feature threads of rubber or elastic wound tightly around the core. The cores of today’s balls are generally wrapped with synthetic rubber or plastic. Some Titleist balls, for example, use thermoplastic resins called ionomers. Nike surrounds its resin-center ball with synthetic rubber. Other balls are referred to as “dual core” because the core and the next layer or layers are all made of synthetic rubber. As of 2012, the most complex balls contain five pieces, including the cover. TaylorMade produced the first five-piece ball, containing a small rubber core surrounded by three progressively firmer layers made from synthetic rubber, HPF 1000 (an ionomer resin) and thermoplastic, respectively. According to USGA regulations, a golf ball must weigh 1.62 ounces or less. There is no minimum weight. The ball’s diameter cannot be less than 1.68 inches. There is no maximum size regulation, though obviously a larger ball will be disadvantageous on the putting green. A ball’s internal construction is a key factor that determines which ball a golfer should choose. One-piece balls are strictly for practice. Average golfers are generally fine with two-piece balls, which are durable and will roll farther than multilayered balls. Balls of three or more pieces – which also feature softer covers – are generally for advanced players. They’re lighter and easier to spin, allowing pros and low-handicappers to stop the ball on the green, for example.